One of the biggest weekends in the state of Florida’s Boxing scene occurred between June 23rd-25th as the 2017 Florida Boxing Hall Of Fame weekend took place at the beautiful Westshore Grand Hotel in Tampa, FL. Among the various events that compromised the weekend was the annual FBHOF Amateur Fight Night on June 23rd, which featured a seventeen bout card comprised of amateurs of various levels from across the state as well as a meet and greet with some of the inductees that made up the 2017 class. This observer was honored to be in attendance at this event and was at ringside for the card. Here are some of the highlights of what took place on this card. In JO division bouts: Jomar Blasin representing Gladiator Boxing Tampa Bay scored a third round TKO of Rodney Morris representing Belle Glade P.A.L. All of the bouts on this card were scheduled for three two-minute rounds and that meant the action inside the ring started quickly as fighters looked to gain an upper hand on their opposition. In this fight, Blasin was able to withstand the aggression of Morris to force a standing eight count in the first round. A left hook to the head of Morris late in the second round forced a second standing eight count. In round three, a right, left combination to the head of Morris by Blasin forced a third standing eight count and forced a stoppage of the fight by Referee Bob Nicholson. Although Morris was aggressive early in this bout, he seemed too intent on trying to end the fight in the first round and perhaps due to the two minute round length, did not pace himself allowing Blasin to get the better of the action particularly in exchanges by landing the cleaner punches. Albert Jenkins representing Belle Glade P.A.L scored a three round split decision over Alberto Blanco. Unofficially, I scored in favor of Jenkins two rounds to one or 29-28 in points. Landon Minus representing Belle Glade P.A.L scored a three round split decision over Alberto Zumaeta representing Elite Boxing. Zumaeta started the fight landing a combination to the head of Minus. Minus however, finished the first round strong landing punches on the inside of Zumaeta making the round a close one. Minus was able to outwork Zumaeta in the second round, but it was Zumaeta, got the upper hand in the third and final round, in my opinion and I scored the bout two rounds to one or 29-28 in his favor. Although I thought Zumaeta won the fight, I believe Minus got the nod from the judges based on how effective he was when he was able to get on the inside of Zumaeta as well as his overall aggression. Albert Jenkins representing Belle Glade P.A.L scored a three round split decision over Alberto Blanco. This was another close and competitive fight where both fighters had their moments. Jenkins was able to be more active and effective in my view as I scored all three rounds in his favor or 30-27 in points. In an Open Class bout: Malik Roberts representing Double V. Boxing Club scored a three round split decision over Terrence Gipson representing Main Event Boxing Club. This was one of the more difficult fights to score on this card, in my opinion as I thought Gipson won two out of three rounds or 29-28 in points and scored the fight unofficially in his favor. I can easily see how some may have seen the fight going in favor of Roberts. Shamara Woods representing Elite Boxing scored a three round unanimous decision over Jhnealle Gilman, who was not representing a Boxing team or club on this card. Woods consistently pressed the action throwing hooks with both hands and pushing Gilman back. Despite having a reach advantage over Woods, Gilman was unable to control the tempo of the combat and could not control distance to keep Woods from coming forward and that was what allowed Woods to earn the unanimous decision, in my opinion. Unofficially, I scored all three rounds of this bout for Woods or 30-27 in points. Woods’ overall aggression and ability to land the more effective punches was the story of this fight. In other action, Jibir Pough representing H&G Boxing scored a second round stoppage of Marguis Newwell representing Team China Smith. Roberto Beltran representing Marco Island Boxing Club scored a three round unanimous decision over Jaime Perez representing SJC Boxing Team. Perez went down shortly after the beginning of the fight from what appeared to this observer to be a slip, but was ruled a knockdown by Referee Michael De Jesus. Beltran was able to control this fight with his movement, jab, and combination punching as he was an elusive target that Perez had trouble finding consistently. Unofficially, I scored all three rounds in favor of Perez or 30-26 in points. Aimable Marckens representing Young Guns Boxing Club scored a three round split decision over Kelly Marlon. Although all of the rounds in this fight were close, I felt Marckens won all three rounds or 30-27 in points based on landing the cleaner punches. Isreal Bencivenga representing Elite Boxing scored a three round unanimous decision over Jorge Hernandez, who was not representing a Boxing team or club on this card. Unofficially, I scored all three rounds in favor of Benchvenga or 30-27 in points. Douglas Ruiz representing Beast Mode Boxing scored a second round stoppage of Jerry Moore representing SJC Boxing Team. Ruiz landed some flush right hands in the opening round, had success catching Moore in exchanges with both hands, and forced a standing eight count by Referee Michael De Jesus. In round two, Ruiz forced a second standing eight count after landing a flush combination to the head of Moore as he had Moore against the ropes and would get the stoppage of Moore later in the round. In what may have been the fight of the night in the eyes of some, James Walker, who was not representing a Boxing team or club on this card, scored a devastating third round knockout of Antonius Grable representing SJC Boxing Team. After two relatively even rounds where both fighters had their moments, Walker brought a sudden conclusion to the fight with a flush left hook to the head of Grable knocking him down and out. Despite the brutal nature of the knockout, Grable was able to get up and left the ring under his own power. This was frankly a scary knockout to watch especially when one considers that this was a bout between two novice amateur boxers. It should however, remind any fan that Boxing just like all combat sports is a one where the participants take a risk on both the amateur and professional level and that what makes the sport so great is that anything can happen at any given time. Prior to the knockout, I had the fight even at one round a piece, Given the dramatic ending to this bout and how competitive it was prior to it, it would not surprise me to see Walker and Grable’s paths cross again at some point. Richard Graham representing St. Pete Boxing scored a three round unanimous decision over Dejon Bendezu representing SJC Boxing Team. Graham attacked Bendezu with both hands from the opening bell and was able to force a standing eight count in round one due to Bendezu not throwing much offense in return. The second round was close due to the pace of the fight slowing slightly, but in my eyes Graham was the more active of the two fighters and was the one forcing the action. Graham continued to control the tempo in round three and landed some solid right hands on Bendezu as well as outworked him on the inside to earn the unanimous decision. Unofficially, I scored all three rounds in favor of Graham or 30-26 in points. Graham’s cleaner offense and greater activity made this a convincing victory for him. Lecorey Fields representing Team China Smith scored a three round unanimous decision over Justin Crimmis representing SJC Boxing Team. Fields started this fight well working behind his jab and looking to mix in combinations, but as the first round progressed, Crimmis was able to use his strength to land some shots of his own in what ended up being a close round in my view. What made this fight difficult to score was Fields was most effective during periods where he was able to keep the combat at a distance where it allowed him to control the tempo with his jab. Crimmis meanwhile was most effective when he was able to use his size to push Fields back and get on the inside where he was able to land some effective body punches on Fields. A small combination to the head of Crimmis late in the second round however, led to a standing eight count and turned what was an otherwise narrow and close fight in Fields’ favor. The third round saw Fields being more aggressive being the more active fighter and landed some combinations. Fields would go on to earn the unanimous decision victory. Unofficially, I scored this fight in favor of Fields giving him all three rounds or 30-26 in points. Although a shut out score may not indicate a close competitive fight in the eyes of some, the second round was dictated largely by Crimmis in my view and had it not been for the combination that led to the standing eight count against him, the fight would have been even on my card. This was one of the more competitive fights of the evening, in my opinion. Colby Shaw representing Young Guns Boxing Team scored a first round stoppage of Roy Jones representing Team China Smith. A combination to the head by Shaw sent Jones down to the canvas in a neutral corner. Although he was able to beat the count, Jones was unable to continue and the bout was stopped by Referee Raymond Ortiz. Shaw was simply too strong for Jones and once he saw his opportunity he took advantage of it. Miguel Garcia, who was not representing a Boxing team or club on this card, scored a three round unanimous decision over Ollen Galdames Garia representing Jupter Boxing. Much as was the case with some of the other bouts on this card, Garcia was simply the more effective fighter over three rounds and forced the action. Unofficially, I scored all three rounds for Garcia or 30-27 in points. Marques McBride, who was not representing a Boxing team or club on this card, scored a third round stoppage over Bilal Quintyne representing Main Event Boxing Club. Despite being at a height disadvantage, McBride was able to force the action in round one and was able to land the more effective punches. In the second round McBride continued to press forward forcing Quintyne back and throwing combinations. In round three a barrage of punches by McBride forced a standing eight count of Quintyne and led to Referee Bob Nicholson stopping the fight. McBride simply did what he had to do against a fighter in Quintyne, who was not able to offer much resistance as the fight progressed. Inu Matelau representing Young Guns Boxing Team was declared the winner by disqualification in the third round in his bout with Tyler Yavarar representing St. Pete Boxing. The first round of this fight was close and I thought Yavarar had a slight edge due to landing the cleaner punches. Yavarar was penalized a point for holding in round two and in round three was disqualified by Referee Bob Nicholson. There was a lot of holding in this fight and that could be due to perhaps a bad meshing of styles between the two fighters, similar to what happens from time to time in Professional Boxing. Although this observer did not see the foul which led to the disqualification from my position at ringside, it was a judgment call by the referee. The decision however, was not a popular one with the crowd in attendance, who responded by booing the call. Closing Thoughts: Longtime readers who have followed this observer’s work in both online and in print over the years should be familiar with one of my most consistent themes. To focus on what is good and will benefit the sport of Boxing long-term. It goes without saying that one of the things someone who writes about and covers sports will deal with from time to time is the opinions of those who choose to focus on the negative aspects of sports. Boxing is one such sport where there is no shortage of fans voicing their outrage on a regular basis. 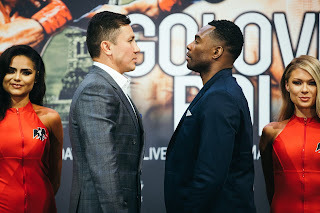 Although it is understandable to a degree when such outrage is expressed depending on the situation, I have at times been accused of perhaps being too optimistic and for seeing the good in Boxing when no one else seems to. During my time at this event, I had the opportunity to speak with some of those who were inducted on June 25th into the Florida Boxing Hall Of Fame as well as others who were also in attendance and one of the pleasures of the evening was simply to sit and listen to the various stories that they shared whether it involved a particular fight or event that they were involved in or listening to how they became involved in the sport. As I listened, I was reminded of a guest column that I wrote for Chuck Horton Boxing in May 2015 entitled What Is It Like To Be A Boxing Writer?, where I shared my own story of what drew me to Boxing and addressed the question that I have been asked on more than one occasion of why would I want to cover and write about a sport that is subject to consistent ridicule as well as subject to questions of potential corruption? I stated that it was true that Boxing has had more than it’s share of black eyes over the years and it can be at times all too tempting for fans to throw up their hands and voice their dissatisfaction with the sport. Events like the Florida Boxing Hall Of Fame weekend are a perfect example of the good in Boxing. Not only do those who have contributed in various capacities to the sport have an opportunity to receive the recognition they deserve, but events like this also present a look into what could be the future of the sport by showcasing some of the up-and-coming amateur talent the sport has to offer. Although there will be those who will continue to focus on and criticize Boxing for its flaws and imperfections, it is a shame that some of those detractors could not be in attendance at any of the festivities that comprised the 2017 Florida Boxing Hall Of Fame weekend. Perhaps those who choose to focus on the negative aspects of the sport would have been given a fresh perspective on the good Boxing has to offer. Congratulations to all of the inductees in the class of 2017 Florida Boxing Hall of Fame. For more information about the Florida Boxing Hall Of Fame please visit: www.floridaboxinghalloffame.com.